Headaches are a complex and confusing form of pain. You either know someone who deals with headaches or you struggle with them yourself. The majority of headaches are caused by stiff muscles, tight joints, and poor posture. Many patients who come to Teton with neck symptoms will also report frequent headaches, unaware that the two may be connected. According to the Migraine Research Foundation, the most common age for migraines are between 25 and 55 years old. 12% of the population, including children, suffer from migraines. Out of the 12% American population who suffer, 18% are women, 6% are men & 10% are children. Headaches & migraines are often triggered by an underlying neck problem. For example, some patients complain of aches or tenderness in the neck, and shooting, sharp pains to the connected body parts. Often the primary source of neck pain is tightened muscles, poor posture, daily stress, sitting at computers for long periods of time & good, old-fashioned lack of activity. Alleviating headaches with physical therapy is extremely effective and provides the patient with relief almost immediately. There are beneficial treatments for almost every type of headache. The challenge is determining the type, its cause, and developing a specialized treatment plan that will reduce both its frequency and intensity. PT is used to treat two common types of headaches, cervicogenic or tension-type headaches. Cervicogenic headaches refer to pain that is viewed as happening in a part of the body other than its true source. In the case of a headache, it’s perceived in the head from a source that is actually in the neck. It’s also considered a secondary headache, meaning it is caused by another illness or physical issue. The cause of a cervicogenic headache is a disorder of the cervical spine and its component bone, disc and/or soft tissue elements. Tension-type headaches are the most common of the headaches, impacting about three-quarters of the general population. They range from the occasional mild headaches to those that are disabling, lasting several days. The pain can be described as “a band around my head,” feeling pressure on both sides of the head. Dry needling is a technique used by physical therapists to treat myofascial pain. Myofascial pain is when pressure on sensitive points in the muscles cause pain in seemingly unrelated body parts, often a result from a repeated injury or muscle overuse. Physical therapists use dry needling with the goal of releasing or inactivating trigger points to relieve pain, improve range of motion and pain control, reduce muscle tension, and/or normalize motor function. This can help speed up the patient’s return to active rehabilitation. Dry needling is beneficial for headaches and can help alleviate pain almost immediately. It’s available at many of our Teton Therapy’s locations! Your physical therapist looks for the source of your pain and works with you to develop a program best matching your needs. 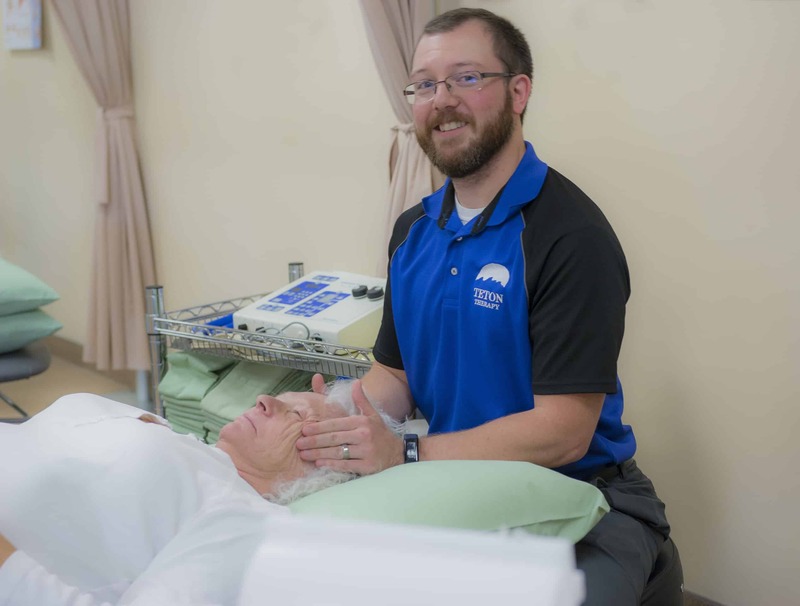 During the first patient evaluation, we discuss your history, examine your spine, and evaluate your movement, strength, walking, and coordination. This helps our physical therapists pinpoint the exact cause of your neck pain. We work closely with you to design a treatment plan that best suits your needs and offers the quickest relief from pain and return to function. Don’t allow headaches to impact your ability to do daily activities, reducing your quality of life. If you want to learn more or have any questions about how physical therapy can help with your headaches & migraines, contact us. We want to see you and your loved ones happy and healthy!